Hair is an essential part of beauty and you must maintain it to keep your hair look gorgeous. But, due to so much of pollution and hectic lifestyle, our hair is exposed to dirt, pollution and what not that may cause severe damage to it and make it unmanageable. And, talking about unmanageable hairs, dry frizzy hairs top the list. If you are one having dry hair, you will surely know the pains. However, amidst the environmental issues that affects our hair, sometimes lack of proper hair care routine is also an important cause behind bad hair quality. One common mistake that most individuals with dry hair make is, skipping the conditioning process after shampooing the hair. And if you are a do it yourself person like me, then you can easily use homemade conditioners for dry hair and I will tell you how to make these natural conditioners easily at home. Using a good conditioner is good for your hair more so if your hair is dry and frizzy. It makes the hair smooth and manageable and so you must not avoid it. I myself was suffering from dry hair issues and then I made it a habit to condition my hair every time I shampooed it. Trust me it helped me a lot in taking care of my dry hair. However, I am a person who is not much into using artificial market products and so I used home ingredients to get my conditioning done. 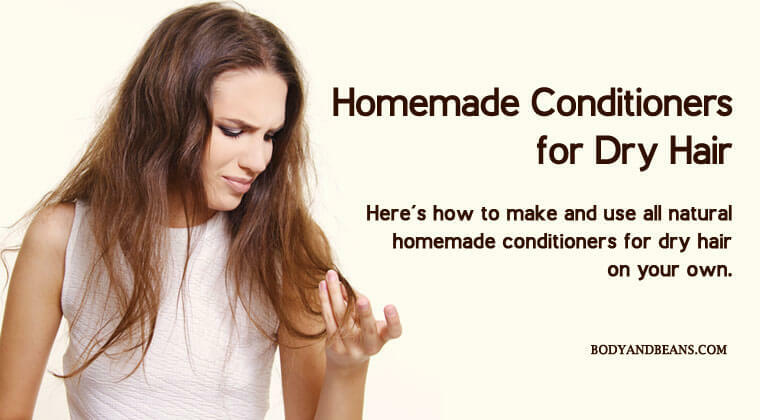 Well, in case you are confused, let me tell you that there are various natural ingredients that can be used to make the best homemade conditioners for dry hair. And today, I am going to talk about top 9 homemade conditioners for dry hair. If you have dry hair and you are looking for best homemade conditioners for dry hair, then here’s the post worth checking. I am sure that your hair is dear to you and you do not want to expose your hair to the chemicals that may damage it. This is the main reason I avoid the commonly available hair care products and prefer using the natural homemade conditioners for dry hair. These homemade conditioners for dry hair are not just good for your hair but it’s also very cost effective. The conditioning methods do not take much of the time and effort and so you may do it easily at your leisure time. Today I will talk about 9 of the best and the most effective homemade conditioners for dry hair. The ingredients that we are going to use to make these homemade conditioners are individually very good for hair. You just have to do a bit of mix and match in right quantities to get the desired hair conditioner that is ideal for dry hair. So, are you ready? I think you are, so let us begin the discussion on the most effective homemade conditioners for dry hair without further delay. Frizzy dry hair is a problem but with little care you can easily deal with it. One of the best ways to take care of dry hair is to properly condition it. With proper conditioning your hair will get smoothen. Listed below are the nine best homemade conditioners for dry hair. Check them out. Coconut oil and honey are probably the best natural moisturizers in the world and when you mix both the ingredients, it becomes one of the best homemade conditioners for dry hair. Once you use this mixture, your hair will naturally become smooth and silky. It will become quite easily manageable which is otherwise the main problem with dry hair. It also nourishes the hair from the roots and strengthens it. Although virgin coconut oil and honey are the main ingredients of this homemade conditioner, you may also like to mix a bit of lemon juice, curd and rosewater to make it more nutritious for dry hair. But, in case you don’t have all these readily available in your kitchen, then you may ignore the lemon juice and curd. Firstly, you have to arrange all the ingredients. So, take around 1 tablespoon of virgin coconut oil, 1 tablespoon of honey, 1 tablespoon of lemon juice, 2 tablespoon of curd and 1 teaspoon of rose water. Once you have arranged all these ingredients, pour each of them in a glass bowl and blend properly so that they get properly combined. Now shampoo your hair and apply this homemade conditioning mask on your hair. Let it stay for around 10-15 minutes and then wash off using normal water. It is not just the oil which does the magic but the coconut milk is equally beneficial in nourishing dry hair. It helps to smoothen the rough strands of hair and rewards your hair with a glossy shine. And, for the best results, add little bit of honey, rose water and vegetable glycerin as all of these are extremely good for dry hair. To make the mask, you need around 4 tablespoons of coconut milk, 2 tablespoon of honey, 1 vitamin E capsule, 1 teaspoon of rose water, and 1 teaspoon of vegetable glycerin. Mix all these ingredients in a bowl and make sure that all the ingredients are properly combined. Now, apply the mask carefully on your scalp and hair. After that, use a plastic cap to cover your hair and then let it stay for 15-20 minutes. This will allow your hair to absorb all the moisture and gain maximum nourishment that this conditioner has to offer. Then wash your hair with lukewarm water and you are done with hair conditioning. Aloe vera has been used for treating various health and beauty problems and now it is time to use it as the perfect homemade conditioner for dry hair. The gel we get from aloe is a perfect moisturizer that can help you get rid of your dry and frizzy hair issues easily. You may use little bit of lemon and peppermint essential oil to enhance its good effects. This is very easy to make and takes just a few minutes. All you need is 4 tablespoon of aloe vera gel, 1 lemon, 5 drops of peppermint essential oil. Take all of these and mix them properly in a bowl and keep it aside for sometimes. Then shampoo your hair and apply the aloe conditioner on your wet hair. Wait for at least 5-7 minutes and then wash your hair properly using cool or lukewarm water and you are sorted. Almond oil is a great nourisher for your hair. It helps increase the growth of hair and repairs the damaged hair which automatically reduces hair fall. It also softens the hair strands and allows your hair to remain glossy and bouncy. Besides the almond oil, I will recommend mixing honey, milk, rose water and coconut milk as well to get the maximum benefits. Take around 1 teaspoon of almond oil, 1 tablespoon of honey, 1 tablespoon of milk, 1 tablespoon of coconut milk, and 1 teaspoon of rose water. Add all these ingredients in a bowl and mix it well and your conditioner is ready to use. Wash your hair properly and then apply the conditioner on your wet hair by parting your hair into sections. You can wrap a towel around your head or put on a shower cap to facilitate maximum penetration. Let it stay for 15 minutes and then wash off your hair using lukewarm or cool water. Olive oil is great for hair and it is especially beneficial for people with dry hair. This is because it helps you get rid of the roughness and make your hair naturally silky. It also helps in growth of new hair and inhibits the hairs from falling. Olive oil in itself is good but for maximum benefits, there are two ways of using it. In one of the methods, you can mix it with any essential oil as per your choice. And, as an alternative, it can be used along with the banana as well. Firstly, you need to take around 2-3 tablespoons of olive oil and then mix it with 5 drops of any essential oil as per your wish. You have to warm this oil and then gently massage it on your scalp and hair. Now, wrap a warm towel around your head and then let it stay for at least half an hour. After that, wash off your hair. You may use a mild shampoo to wash your hair as well. In another method, you have to take a banana and mash it properly. Then mix with2tablespoons of olive oil. You may also mix a bit of honey like around 2 tablespoons in it. Make sure that the paste has achieved a smoothie like texture. After that, apply it on your hair and scalp. Stay for 30 minutes and then wash your hair using a mild shampoo. Avocado has a lot of health benefits and we are not unknown to that but do you know that this ingredient can act as the perfect conditioner for dry hair problems? Well, loss of valuable nutrients from hair often results in dry, frizzy hair but with avocado, your hair will get the proteins and vitamins to regain its lost luster. It will properly moisturize your hair and leave it smooth and silky. In case you want the best results, I will suggest you to mix a bit of apple cider vinegar (ACV) and shea butter in it as well. This is because shea butter will enhance the shine whereas ACV will help in balancing the level of oil in the scalp. This is one of the most effective homemade conditioners for dry hair and to make it you just need 1 ripe avocado, 3 tablespoons of apple cider vinegar and around half cup of shea butter. Put all of the ingredients in a blender and blend it for few minutes. After they are perfectly blended, apply the mask on your hair. Keep it for half an hour by covering your hair with a shower cap. After that, wash it off using water. The most common ingredient that we use in case of severe hair loss is the egg but many often think that egg dries your scalp. However, in reality, it contains protein and lecithin that are great for dry, dull and damaged hair. It imparts your hair with enough shine and nutrition that keeps your hair healthy. But, if you suffer from too much dryhairand fear that using only egg will dry your hair even more, then I would suggest you to use olive oil and honey along with it. These will enable in making your hair soft and smooth. Take 1 bowl and beat around 3 eggs (The number of eggs you need to use depends on the length and volume of your hair that you will have to cover). Then mix around 1 tablespoon of honey and 2 tablespoons of olive oil in it. Whisk the solution well and then apply it on your hair and keep it for half an hour. After that, wash your hair properly with mild shampoo and cool water. Weekly application of this mask is great for your dry hair. In case, you only want to use egg, you just have to beat an egg and then mix it with tepid water to get a thin paste. Apply that on your hair and massage gently for around 15 minutes. After that, wash your hair with cool water and mild shampoo. Yogurt is great for your health and it is equally beneficial for your hair. It has the ability to soften your hair and add that desired shine in it. It also helps to prevent the loss of hair and keeps it healthy and strong. There are two types of yogurt masks that you may use on your hair. One is by combining it with ingredients like honey, apple cider vinegar, coconut oil and peppermint essential oil. And, if you suffer from dandruff, then use the mask by mixing yogurt with orange juice, lemon juice, egg and coconut milk. Here are the steps mentioned below. For the first mask, you need around 3 tablespoons of yogurt, 1 teaspoon of honey, 1 teaspoon of ACV, 1 teaspoon of coconut oil and 5 drops of peppermint essential oil. Mix all of the ingredients well and then keep it aside for a while. Shampoo your hair first and then squeeze the water out of it. After that, apply the paste on your hair and keep it for 15 minutes. Then rinse your hair with water. And, for the other remedy, you need plain yogurt around 1 cup, 4 tablespoons of lemon juice, ¼ cup of orange juice, 1 egg, ¼ cup of coconut milk. Mix all ingredients well and make a smooth paste out of them. Wash your hair and then apply the paste on your wet hair. Cover your hair with shower cap and keep it for 30 minutes. After that, wash your hair using water. This is one of the perfect homemade conditioners for dry hairand you can use it weekly to get the desired benefits. I know it’s hard to imagine pumpkin on your hair but if you can keep your awkward feeling aside for a while and try it out on your dry hair, then I am sure you will be greatly rewarded. The rich content of vitamins in it is great for your hair and strengthens your hair from the roots. Besides, it also contains the potassium that leads to growth of new hair as well as imparts that shine into it. Honey is for the moisturizing part. But, you can also use other nourishing ingredients like coconut oil and yogurt to make it more effective. For making the pumpkin and honey hair mask, you will need to make a pumpkin puree with 1-2 tablespoon of honey in it. Then you have to mix the ingredients well to make a thin texture. Let it stay for 15 minutes and then wash off using mild shampoo and water. And, if you want to use the other ingredients as well, then take around 2 cups of pumpkin puree, 1 tablespoon of coconut oil, 1 tablespoon of honey and 1 tablespoon of yogurt. First mix the pumpkin puree and the yogurt in the processor and then mix the honey and coconut oil. Blend to make a thin paste and then apply it on your hair. Let it stay for around 15 minutes and then wash off using water. Individuals having dry hair know how difficult it is to manage. It is rough, it is frizzy, it is easily breakable and it often causes dandruff. Hence, dry hair needs proper care. You have to maintain a good hair care routine that is ideal for your hair type and that must include conditioners. Your hair must be conditioned to make it smooth and silky. Although, there are a number of conditioners available in the market, I recommend using homemade conditioners for dry hair. This is because such ingredients are inexpensive and are safe for your hair in comparison to the market-based products that are costly as well as may contain chemicals that may further led to hair damage. We have already discussed about the top 9 homemade conditioners for dry hair. I have also explained about all the natural ingredients and the process of making and using these homemade conditioners for dry hair. I have personally used some of them and I have been greatly satisfied. Try using any of these conditioners and I am sure it will help you manage your dry hair much efficiently. However, besides following the effective homemade conditioners for dry hair, you need to lead a disciplined lifestyle. 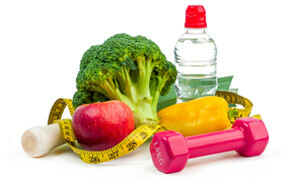 Eat all kinds of nutritious foods and avoid the junk oily ones. This will give your hair proper food for that it needs to stay healthy. And, please drink lots of water to keep your system hydrated as dehydration may lead to drying off your hair roots and causing other hair related issues. Another thing that you must neverforget is that you must not shampoo your hair too much. Excessive shampoo dries your hair a lotand robs the natural oil out of it which is bad especially for dry hair. It is best that you shampoo 2-3 times weekly and do the conditioning of your hair after that using the homemade packs that I have suggested. This will keep the hair clean as well as not let it dry a lot. And, as far as the shampoo goes, use a mild one. Avoid too much experimentation with shampoos and use the one which has perfectly suited your hair type. Also, try to be natural with your hair styling as much as possible. All the hair colors, hair gels, hair straightening or hair curling instruments must be avoided as much as possible as they dry up the hair even more. So, are you suffering from dry hair and its consequences? Then, it is time that you try out the natural and homemade conditioners for dry hair. This will help you in getting gorgeous hair just the way you desire it to be. Until then, stay happy, stay gorgeous and do not forget to share your valuable feedbacks and suggestions with me in the comments section. And, if you like my posts then share it and spread the word among all.